In many cases we get an application in advance for placing an Oled Mirror TV from an architect, a dealer or the client. This is very useful, because at that moment a plan of action can be made. This is useful for the installer and the domotics/home automation specialist. We are happy to discuss all details directly at the first building meeting. This prevents duplication of work and saves extra costs. The glass plates are packaged In the Netherlands and Belgium, but they are delivered without a crate by Oled Mirror TV to the dealer or to the end customer. For deliveries outside the Netherlands and Belgium, the glass plates are packed for protection in a solid wooden crate. 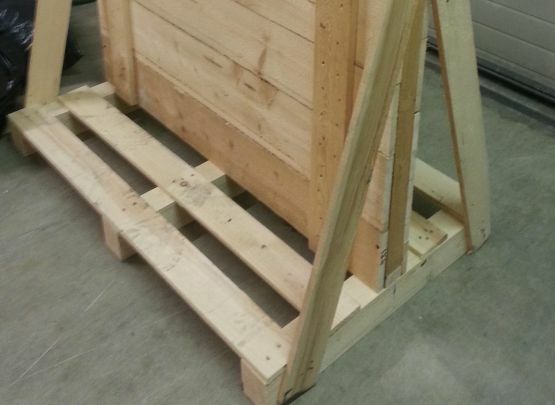 The costs of production of these custom-made crates are charged to the client (at cost). The price of the crate depends on the size of the glass. Several glass plates can be placed in the wooden crate. For transportation of the goods to other countries, we advise you to hire a transport company from your country. There are always transport companies in your country that specialize in transport to and from the Netherlands. This prevents high transport costs. In addition to the mirror with the Oled monitor, it is also possible to order extra glass or mirrors from Oled Mirror TV. In this way you can complete a project and prevent any colour differences. For example, you can create a fitness wall with different mirrors, a fireplace with multiple glass surfaces or mirrors, and kitchen (or bathroom) furniture with different mirrors. To give you an idea: If you buy normal mirrors from two different mirror manufacturers, you will immediately see a colour difference. Oled Mirror TV has a very exclusive mirror collection. We produce and process these mirrors ourselves and they are exclusively available from us. In the production of the mirrors, we focus on achieving the best image result. With the Secret Silver Mirror and Secret Silver Mirror Bright, the image of the Oled monitor is truly of superior quality when the Oled monitor is on. If the Oled monitor is off, it is really invisible. And it is precisely here that we distinguish ourselves. There are many mirrors for sale that resemble our mirror, but they cannot provide the same quality image. We only supply customized mirrors and glass surfaces. The largest mirror we can supply is 3100 x 2000 mm. Explanations and information about the different operations and options of mirrors and glass surfaces can be found on this website under "Products" - Mirrors - Glass (larger sizes on request). If you prefer to do the installation yourself or to outsource the installation to a contractor or installer, or if you would like to have the monitor built into a wall, element or furniture, then we recommend ordering our Prefab built-in units. We make special metal or wooden back-boxes / built-in units so that they can be easily installed. After the Oled monitor has been mounted in the back-box, you can secure the glass to the front of the back-box by means of a magnetic system. If you need to access the monitor for service, you can easily dismount the glass. The price of the Prefab back-box depends on the size of the glass or the mirror. The installation team of Oled Mirror TV has been installing the monitors and the glass for more than 15 years. As we are installing mirrors, glass surfaces and monitors, it is especially important that the work is carried out carefully. Walls must be perfectly straight and any recessed areas must be made flush. These are very important points that must be clearly discussed with the contractor and the plasterer beforehand. If a contractor or plasterer is instructed by the client to carry out the preliminary work, it is important that a spirit level is not used, but a cross laser is used instead. Spirit levels are usually much too short and do not work well. Especially with larger lengths this is clearly visible and can be crucial. It is also possible to outsource the preliminary work to us. We make a lot of fitness front walls to fix the glass against. But we also make the complete mounting of a fireplace of fire-resistant material. Everything is made straight and with a cross laser. For an assignment we will come to take measurements for free anywhere in the Netherlands. For locations outside of the Netherlands, we would charge for this. The prices for the installation are shown in our price list, which you can request through one of our dealers.